It didn't work. In the next match against Italy, Ireland won but gave its poorest display yet in the championship. So the Irish took another approach in the second off week. A three-day minicamp in Belfast that was more about team bonding than practice. In their own words, the players chilled out. Whether it translates into a much improved performance will be revealed on Sunday, when the Irish welcome France to Lansdowne Road. The pressure is on Ireland to take care of business to ensure it has a shot at defending the title in the last round next week in Cardiff. Why the Irish haven't come close to being the guys who swept all before them last year has been vexing them and their fans for five weeks, ever since England came to Dublin for the opening game and crunched them in a stunner. Coach Joe Schmidt believes his team has been laboring because they were too anxious to try and live up to 2018, and they were "broken" by England, who made the Irish doubt themselves. Schmidt's New Zealand counterpart, Steve Hansen, chipped in this week about how his warning from November that the Irish would find it much harder to be the hunted than the hunter had come true. "It's different when you're sitting at the top of the tree," Hansen said after his All Black lost in Ireland for the first time. "Not many teams cope with it that well." After shaky away victories against Scotland and Italy to stay in the title hunt, the Irish still believe they can win the championship. "I know we haven't been ourselves but we're creating a lot and it's going to have to click at some stage," winger Keith Earls says. "We haven't changed anything. It's a strange game. Bar New Zealand, teams go up and down. That's just the life of rugby. We're not getting frustrated. We're not going into our shell or worrying; I think a lot of people outside the circle are. "No game plan has changed, no meetings or panic is happening. Everyone expects us to blow every team out of the water now but that's not the case. Being No. 2 in the world, everyone is going to try everything at you." Rob Kearney agrees they are close to regaining their swagger. "A team's confidence can come back in one set-piece, three or four phases of play, where passing is really accurate," the fullback says. "You find the holes or the gaps that you scouted during the week, people running onto the ball at pace, you score a try at the end of it, everyone is jumping in on top of each other, celebrating a try. "The great thing about a team lacking a little bit of confidence is that it just takes a small spark to get it back. That is what we will be hoping for early on at the weekend." 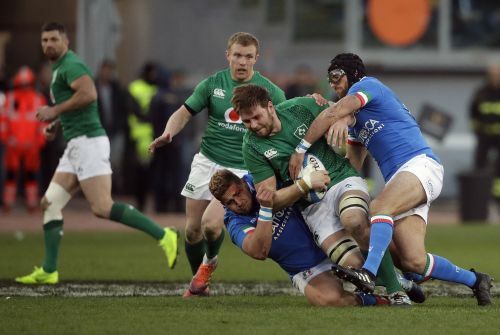 Schmidt has also tried lighting a little fire by dropping British and Irish Lions flanker Sean O'Brien, who started in the wins against Scotland and Italy but failed to impress. O'Brien didn't even make the reserves. Josh van der Flier, who started against England, was preferred on the open side. France, which hasn't won in Dublin in eight years, showed off its newfound confidence on Tuesday by picking the same 23 who took apart Scotland 27-10 in Paris. New backs Antoine Dupont, Romain Ntamack, and Thomas Ramos, and prop Demba Bamba have another chance to excite again. The changing of the guard means there are only five survivors — all of them forwards — from the lineup which was edged by Ireland last year in Paris on Jonathan Sexton's injury-time dropped goal. "I am looking for our younger players to progress in every game," coach Jacques Brunel says. "They have shown a lot of calm against Scotland but this will be another test. "All teams find confidence through positive results. It is clear that we now need to put together a series of good performances and, beyond the result, it is about the quality that we show in our matches. That's what gives you confidence and allows you to move forward." Ireland: Rob Kearney, Keith Earls, Garry Ringrose, Bundee Aki, Jacob Stockdale, Jonathan Sexton, Conor Murray; CJ Stander, Josh van der Flier, Peter O'Mahony, James Ryan, Iain Henderson, Tadhg Furlong, Rory Best (captain), Cian Healy. Reserves: Niall Scannell, Dave Kilcoyne, John Ryan, Ultan Dillane, Jack Conan, John Cooney, Jack Carty, Jordan Larmour.